Rand Paul is the most interesting contender for the Republican nomination. And when I say interesting, I mean that in the broadest sense. A case in point: Last week, the Kentucky senator hit some turbulence when the Washington Free Beacon reported that Jack Hunter, Paul’s aide and the coauthor of his book, “The Tea Party Goes to Washington,” was once the Southern Avenger. Who’s that? Starting in the 1990s, as a radio shock jock, Hunter would wear a wrestling mask made from a Confederate flag, while making jokes about the assassination of Abraham Lincoln and having the South re-secede. “Although Lincoln’s assassin, John Wilkes Booth’s heart was in the right place, the Southern Avenger does regret that Lincoln’s murder … turned him into a martyr,” Turner said in 2004. Maybe the humor is all in the delivery? “Negatively of Lincoln” is a curious understatement, given that Hunter — who admits to giving a “personal toast” to Booth on his birthday — once suggested Lincoln would have had an amorous relationship with Adolf Hitler. Such controversies are hardly new to Paulworld. Most famously, Rand’s father, former Rep. Ron Paul, the three-time presidential candidate (for whom Hunter worked in 2012) published newsletters bearing his name that brimmed with bigoted bile. When his writing became controversial, the elder Paul insisted he hadn’t known what was in his own newsletters (though in 1996 he took responsibility for them). Both controversies stem from the same sinful strategy adopted by so-called paleolibertarians in the 1980s. The idea was that libertarians needed to attract followers from outside the ranks of both the mainstream GOP and the libertarian movement — by trying to fuse the struggle for individual liberty with nostalgia for white supremacy. Thinkers such as Murray Rothbard hated the cultural liberalism of libertarians like the Koch brothers (yes, you read that right) and sought to build a movement fueled by white resentment. This sect of libertarianism played into the left-wing view of conservatism as racist. The newsletters, probably ghostwritten by Rothbard and former Ron Paul Chief of Staff Lew Rockwell, were the main organ for this effort. By no means do all Ron Paul supporters subscribe to this dreck. Some are ignorant about this history, while others dismiss the controversies as a distraction from Paul’s real message. Most take great offense at any suggestion that Paul or Paulism has anything to do with racism. Rand Paul literally and figuratively grew up in the shadow of all this, but while he’s always circumspect when talking about his dad, in private and in public he has given no hint of subscribing to the Rockwell-Rothbard thesis. Indeed, he is sincerely eager to reach out to African-American voters on issues like the drug war. Rand Paul shares his father’s ambition to be president. Color me skeptical. Even though he’s a vastly better politician — morally and strategically — than his father, in a climate where politicians like Mitt Romney and John McCain can be demonized as bigots, should Rand Paul ever be nominated, one can only imagine what his opponents, in and out of the media, would do. Unfairly or not, his task of clearing the air would be Augean. Hence another irony. Defenders like Napolitano think Paul’s critics subscribe to a “dying ideology,” but Paul’s only shot at the White House hinges on thoroughly interring an ideology far more deserving of death. He’s got a lot more work ahead of him. 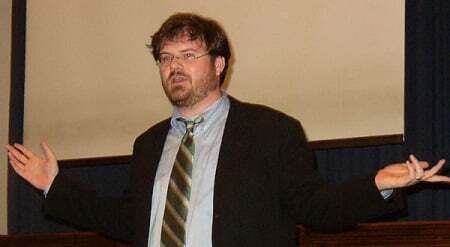 Jonah Goldberg is the author of “The Tyranny of Clichés,” now on sale in paperback. You can write to him in care of this newspaper or by e-mail at [email protected], or via Twitter @JonahNRO.